N14 diesel of 450 hp at 2100 rpm. Class 175 is a diesel-hydraulic railcar train built in 1999 - 2001 by the Alstom plant in Washwood Heath, Birmingham and owned by leasing company Angel Trains. There are two versions, two-car 175/0 and three-car 175/1; the whole fleet is based at Chester depot. The story of their ordering and development is a complex and problematic one: see 'Prehistory' below. 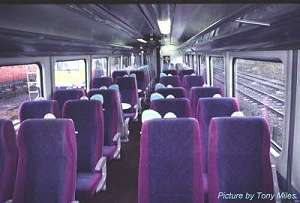 Although the type suffered from technical difficulties in its early days, inckuding a number of engine fires, many believe that they have the most comfortable passenger accommodation of all the new trains built since Privatisation, especially in terms of legroom. With an idea of offering some kind of 'premier class' (which has never materialised, despite a brief re-invention of the idea by Arriva) the seats at one end of Coach A of the three-car sets were fitted with 'at seat entertainment' sockets and controls, designed to play a random selection of music from a multi-disc CD player aboard, although these were seldom used and fell into disuse. Originally built for service with the First North Western company, changes to franchises later meant that although all were leased by Arriva Trains Wales, sub-leasing arrangements from February 2004 meant that Chester depot, had to supply a daily allocation to three different train companies: Arriva Trains Wales, First North Western and Trans Pennine Express. To this end, the First North Western logos were removed from the vehicles. First Group basic livery was retained, but in 2005 a start was made in applying a new "ghostly" version of Arriva's colour scheme (above), although without branding and logos. Car 50753 of set 175 103, which was out of service due to a derailment, also carried the scheme when displayed at the National Railway Museum in November 2005, but the vinyls were removed soon after. 175 008 and 175 110 were the only ones to carry this livery in traffic, and indeed did carry logos for a short time. It became extinct with the repainting of 175 110 in April 2009. After delivery of new Class 185 units to Trans Pennine in 2006-7, all 27 175s became wholly dedicated to Arriva Trains Wales and all vehicles were given ATW logos. 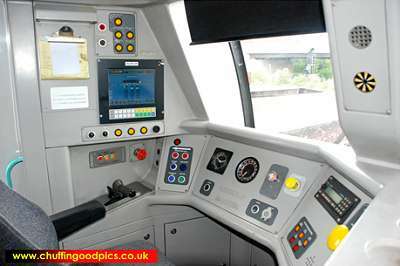 Repainting began in earnest at the beginning of 2008, the units being sent one at a time to Alstom at Oxley, Wolverhampton for treatment. It was decided that pale-coloured "ghostly" scheme would not be perpetuated, and instead the standard Arriva colours (as found on their buses) and branding were applied. The first to be done was 175 008 - which thus gained its third livery - followed by 175 010 (see heading picture). The last to be done, in July 2009, was 175 115. 175 008 seems to have a history of 'firsts' - it was also the first to catch fire and spend some months being repaired - as it was the first to receive a name (since removed): it was named Valhalla (after the big ride at Blackpool) on 2 November 2000. The name was chosen in a First North Western/Asda competition and was submitted by 11-year-old Adam Cotton. (Earlier public competitions for names seemed to fizzle out.) This name was carried on the white stripe of the FNW livery; later ones done under FNW were a rather tacky vinyl pseudo-nameplate. The only Arriva naming, 175 003, had a different style looking more like a real nameplate, but Arriva removed all the names during repainting in their livery. The 175s never carried the second, dark and light blue, livery seen on the 158 and 150 units and loco-hauled coaches. From October 2018 the lessee of the whole fleet became KeolisAmey, holders of the Transport for Wales franchise, and a start was made in applying all-over vinyls in the TfW grey and red colours, 175 107 being the first to be treated. TfW plan to replace the 175s with new stock during their franchise; it seems doubtful that other franchises will wish to operate them, but it remains to be seen. When North West Regional Railways was franchised to the Great Western group in 1997, the package included the introduction of 70 new diesel vehicles to displace the 40-year-old 'heritage' stock still in service and to pioneer a service to London in competition with with Virgin, both from the Manchester area and the North Wales coast. Initially it was suggested that some would be 3-car sets capable of 125 mph for the London services, whilst the rest would be a mixture of one-car and two-car sets. GEC Alsthom were soon chosen as the constructor, and the inistal thought of single cars was revised to 2- and 3-car 100 mph sets plus 9 three-car 125 mph sets. Artists' impressions from 1997 show the more streamlined front proposed for the faster units. The side view shows a remarkable resemblance to the same builder's earlier Class 156 trains. 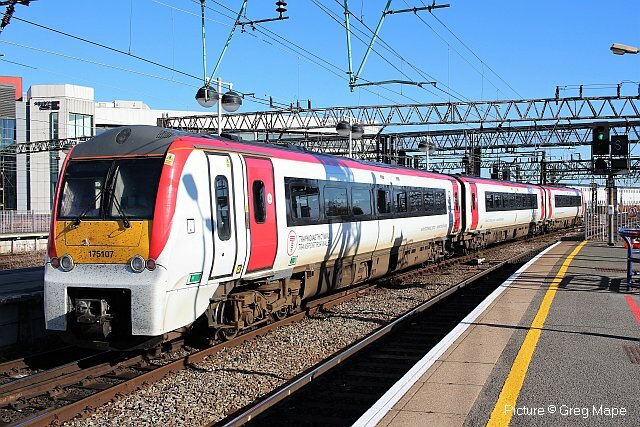 After First Group took over in 1998, it became clear that high-speed running to London was out of the question, as Railtrack and Virgin Trains had agreed that Virgin would have exclusive rights to fast trains in return for an investment in the refurbishment of the main line. As a result, the plan was revised again, and what was actually ordered were 16 3-car and 11 2-car sets, all of the same 100 mph design. 125 mph sets were, however, built for Great Western Trains. Meanwhile, GEC Alsthom changed its name to Alstom, apparently to clarify the pronunciation. The original name was the Alsace Thomson-Houston Company. The livery chosen was based on the First Group standard for new buses. The trains were assembled at Alstom's Washwood Heath plant near Birmingham, once owned by Metro-Cammell. 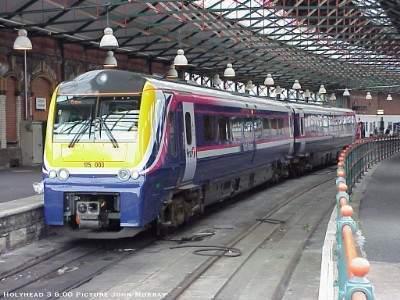 Test runs began in Autumn 1999, and the first train to enter First North Western stock, two car set 175 003, was delivered to Chester Depot on 23 December 1999, with the others sceheduled for delivery during 2000. The new units are referred to by Alstom as their Coradia 1000 series - Coradia being a word said to mean 'Inter City' in Greek. 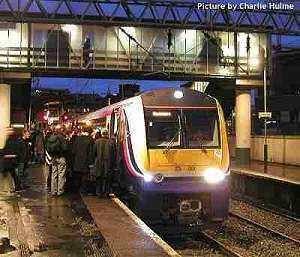 As of February 2000, five two-car units were in stock at Chester, but running on the main line under an 'Interim' safety certificate only, permitting tests and driver training but not carriage of passengers. Nine months later, in November 2000, Class 175s were becoming a common sight on North Wales and Mid-Cheshire services, with crew training in progress for the Barrow and Windermere lines, even though at that time only nine of the 27 trains on order had been accepted unto the First North Western fleet. 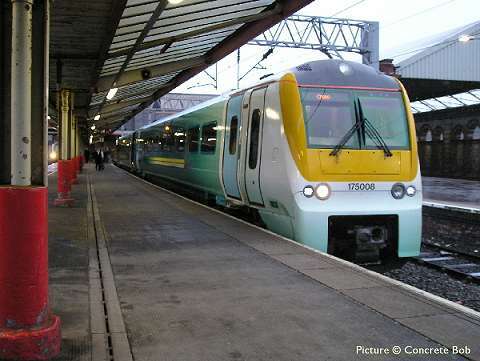 The three-car units in particular were very slow in delivery, only 104 and 105 having been seen in service at the beginning of November 2000. 175 101 remained an instrumented test train, and the first two to be delivered, 001 and 002, still awaited modifications before they could be used. It was 2002 before all were officially accepted by First North Western. 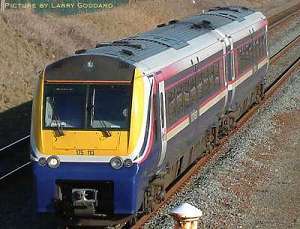 A similar type of train, but in five-car form and with bigger engines (suitable for 125 mpg running) and more streamlined ends, was built by Alstom as Class 180 for First Great Western: in 2007 it emerged that FGW were returning these to the leasing company, making their future uncertain. Arriva apparently looked at the possibility of taking some, but in the end decided the cost would be too high. In early 2008 it was announded that a small fleet would be used by Hull Trains, and at the end of 2009 three were (remarkably) allocated to Northern Rail for use on local services on the Hazel Grove - Manchester - Blackpool axis. After a complicated series of transfers, by 2018 the fleet was shared by two 'open access' operators, Hull Trains and Grand Central, for use on services out of London Kings Cross. Alstom has ceased to build trains in the UK, so it is most unlikely that any more of these 'Coradia' (as Alstom calls them) trains will ever be built. Compiled by Charlie Hulme, with assistance from many contributors.